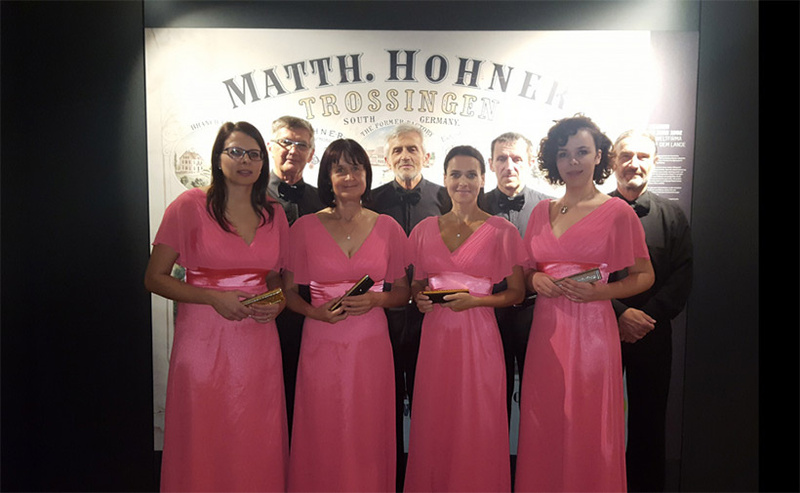 The Harmonica Concert Ensemble SORARMONICA is the leading Slovene harmonica group, constituted by four women and four men of various generations of enthusiastic music lovers, harmonica players from different parts of the country. Its repertoire is designed by music from the old and new classic to the artistic arrangements of folk and light music from all over the world, written mostly by Vladimir Hrovat, its conductor and a member as well: a professional violinist, multi-instrumentalist, concert harmonica soloist, and multiple awarded composer. During just a few years of its existence, the ensemble counts a rich number of appearances at different occasions, at different places, in different countries – Slovenia, Croatia, France, Germany, Estonia, Great Britain, Italy, Taiwan – performing, among others, special interesting whole evening concerts in good natural acoustic halls. After a heap of medals and a Grand Prix from the international harmonica festivals (Pärnu - Estonia, Bristol -UK), the ensemble recorded and published two CDs as well: SORARMONICA – In The World Of Classics and SORARMONICA – ET(H)NO as well.